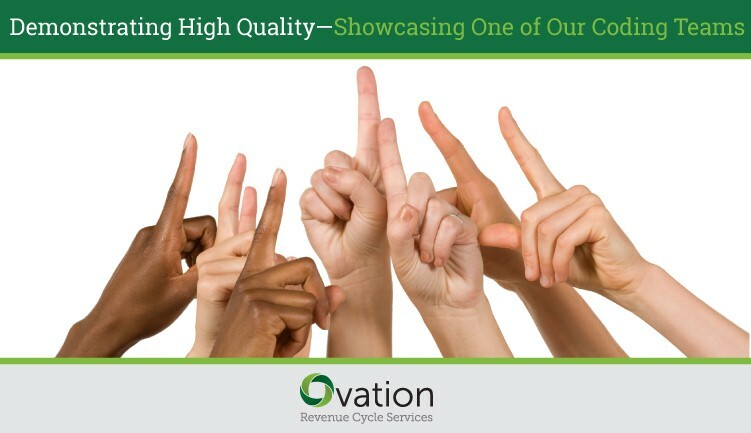 Ovation Revenue Cycle Services recently posted the Top Ten Reasons to Outsource Your Medical Coding. Reason #7 was Lean Six Sigma; a process improvement methodology that relies on a collaborative team effort to eliminate waste and improve efficiency. Waste in medical coding is commonly described by terms such as incomplete and inaccurate coding. Our coding team practices this commitment daily as demonstrated by their high quality medical coding efforts. While we continuously monitor ourselves, our clients frequently audit our work as well and provide feedback that we use to improve training and assist our coders to achieve quality performance. In fact, one of our clients recently audited our services and found 99% agreement with one of our team of medical coders who code 6,000 radiology records each day. This excellent medical coding team is managed under the direction of Jeanne Stepano, Coding Manager. They are a committed and focused team of 20healthcare professionals who always strive to excel in their work. This time… they just did it! They fared remarkably well in the recent quality audits that were conducted by our customers’ own quality review team. Jeanne has worked for 38 years in medical coding and shares her experience through group education sessions and one-on-one discussion. She is often in discussion with this coding team who produces outstanding results day-after-day. Her medical coding team has unparalleled resolve to exceed expectations. Jeanne is supported by a dedicated leadership team to produce outstanding results day-after-day by ensuring defined checks and balances are adhered to by the team at all times and that the coders have up-to-date information to carry out their day to day work. The mantra by which this team operates is “No Deviations”.